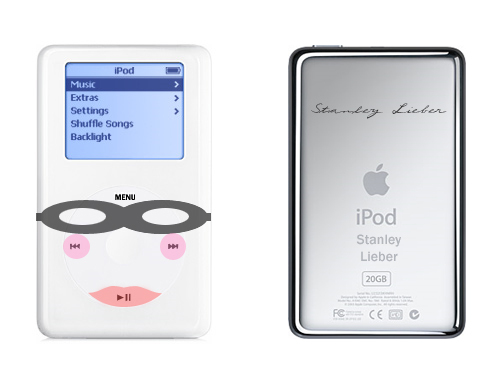 custom stanleylieber iPod by dzima! - I'm not really Stanley Lieber. custom stanleylieber iPod by dzima! I'm wondering how difficult it would be to have these manufactured as skins. I believe lord_whimsy is familiar with the process. that is the best ipod i have ever seen. I never would have thought of it. I love it! the face parts work so well with the button functions. Actually the iPod I just sold and sent off was loaded with all my music (along with about 40gb of other music). My live shows will consist of the (pre-recorded) music playing over loudspeakers while I sit on stage and read a book, draw, or maybe work on oplocromodalizing other music. If it was really my signature you wouldn't be able to read it. i would totally want this but it would just be too much with my stanleylieber pillowcase/ pajama set (tm) and my stanley lieber scuba equipment (tm). Awesome, not many of those were produced. I always wonder who's buying this stuff. I really wish it was possible to buy one of these. wow that is beyond perfect. I would really like to reach into my screen and make this real. i can feel christmas coming on. all wishes fillfulled.